Curry powder is a main ingredient in Indian cuisine. That's not surprising; the spice mixture comes from India. Due to the large number of ingredients, the correct blend ratio is almost a science in itself. This explains why so many different flavors exist. 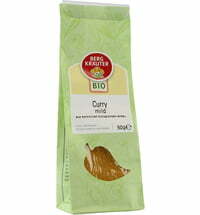 Interestingly, the curry powder used in Europe is not consumed in India. The term curry comes from the Tamil word kari. Literally translated, it actually means sauce. The word curry originally only meant a kind of stew that is eaten with rice or bread. Today's term is derived from the British English. They settled in India during the 18th century. During this colonial period, a curry mixture was created that was tuned to European palates. This flavor is still produced in India. However, it is intended for export only. The flavor we understand to be curry does not comply with Indian tastes, and is therefore not eaten in India. There are countless types of curry blends. Curry powder is a more generic term. The particular composition differs depending on the region and the dish for which the mixture is used. It makes a difference whether you make a curry prepared with fish, meat, vegetables or poultry, and if you eat it in the north or the south of India. The powder has an average of about 13 different ingredients, although this figure may rise up to 36 ingredients in some varieties. 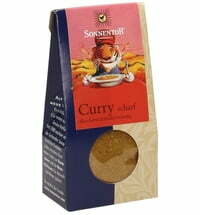 Although there are many different versions, some spices are found in virtually all curry mixtures. These include, for example, turmeric (responsible for the characteristic yellow color), coriander, cumin and black pepper. These and some other spices are responsible for the typical taste of curry. Curry powder not only has a wonderful taste, it manages to give many a bland dish the necessary oomph to get it on its feet. It also has positive effects on our health. With regular consumption it prevents lifestyle diseases, inhibits inflammation and stabilizes cholesterol levels. In addition, the ingredient turmeric is said to have anticancer effects. 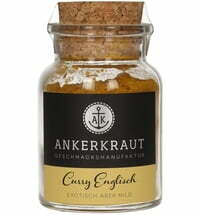 Since the British brought curry powder to Europe, it has spread around the world. In many countries, traditional dishes have developed around curry flavor. Germany boats the Currywurst, in Jamaica, the Curried Goat and in Japan the Katsu Kari.